Amid a festive, almost carnival atmosphere outside Springfield’s Symphony Hall, supporters of Senator Scott Brown and Elizabeth Warren faced off awaiting the campaigns lone debate outside I-495, crowding the streets around Springfield. Although Brown supporters began lining up outside the Municipal Group as early as 10:30 a.m., Warren supporters were clearly more numerous. Most Brown supporters hugged the corner of Court Street and Columbus Avenue while Warren supporters lined Court Street from Main to Columbus Avenue. Music filled the streets from bagpipes for Scott Brown to a four-person band for Elizabeth Warren. Unions were out in force as well, again for Elizabeth Warren. A bus sponsored by the Professional Firefighters of Massachusetts, which endorsed Warren last month, drove around block that sporting a ten foot portrait of Warren. Of course the real show was inside the Hall. Attendees milled about the orchestra and balcony seats as dignitaries and reporters took their own seats. According to tweets from Republican reporters, Elizabeth Warren marched to Symphony Hall with supporters holding signs. The debate, sponsored by a consortium of Springfield area media, the Springfield Public Forum, the University of Massachusetts-Amherst and Western New England University, filled Symphony Hall to capacity. The debate was moderated by WGBY’s Jim Madigan, who received accolades on Twitter for his handling of the debate early and on admonished the crowd not to cheer or elicit other shows of support/opposition. Indeed, unlike the previous two debates, no question on Native American heritage came up. Indeed, that particular controversy did not come up at all. Brown and Warren exchanged blows and parried attacks throughout the debate. Brown appeared to focus on opposition to raising revenue at all costs while name dropping every Western Massachusetts institution he could think of from Milano’s to Westover Air Reserve Base. Warren, by contrast, appeared to focus far more Brown’s record, delivering a sharp contrast with Brown over women’s issues. Indeed, shortly before the debate NARAL Pro-Choice America endorsed Warren. The style of both candidates varied somewhat. Brown appeared more rushed and, although Warren, too, spoke more quickly than usually, the Democrat was a bit more calm and collected. However, on the substance of the debate, more points appeared to go to Warren. Opening the debate on jobs, Warren pointed out that the first anniversary of Brown’s first vote against President Barack Obama’s jobs bill is tomorrow. Brown tried to parry that by rejecting raising taxes under any circumstances, something that would become a refrain of his throughout the evening. On Health Care, which made its debut in Springfield in Massachusetts Senate debates, Brown attempted to repeat a long-debunked talking point that the Affordable Care Act cuts $700 billion from Medicare. Warren fact checked him, noting that Mitt Romney made the same point during last week’s Presidential debate. Brown replied by trying to argue that the President’s health care law would kill jobs, but Warren noted that the bill is helping seniors today. In a separate exchange, Warren promised not to cut Social Security and Medicare. Congressman Richard Neal, who is backing Warren and voted for the Affordable Care Act in 2010, confirmed Warren’s version of the $700 billion in Medicare. In a statement, he noted that the money came out of excessive payments to insurers and fraud on the part of providers. Benefits are unaffected. Neal also noted that Congressman Paul Ryan, the Republican Vice-Presidential nominee, banked those cuts in his budget and used the savings to reduce tax rates for the highest income brackets. On taxes, a heavily repeated subject throughout the campaign, Brown and Warren repeated fairly familiar points. Brown got applause for attacking government spending, comparing it to a “pigs at a trough.” The statement proved ironic, when he later attacked Warren for supporting cuts to defense, which is, by far, among the most lard-laden divisions in the federal government. However, Warren also dispelled a favored talking point of Brown, a reference to a study from the National Federation of Independent Businesses. She reminded the crowd that the NFIB was the lead plaintiff in the lawsuit to overturn the Affordable Care Act and that that group called the late Ted Kennedy “Public Enemy No. 1”. The NFIB is a small business coalition, but, being kind, it would be disingenuous to call it representative of all small business. However, the defining point of the debate came up on women’s issues. Brown trotted out a line from the first debate of fighting for women’s rights since the tender age of six. He also offered a fairly flat claim that he and Warren were both pro-choice. Warren pounced. 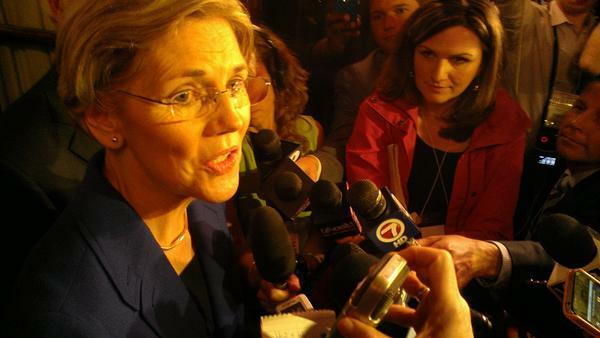 “The women of Massachusetts need a senator they can count on, not some of the time, but all of the time,” Warren said. Without a hint of irony, Warren said she believes Brown loves his family and that he has made some good votes. However, she continued, women need a better defender in a time when issues many thought were settled years ago are suddenly on the line. Foreign Policy also made an appearance, although the differences between the two were minimal. Warren, however, did give a bear hug to President Obama, something Brown overtly did not do to Romney. Brown did reject a nuanced approach to Iran, however, which Warren ascribed to Obama. Defense cuts were somewhat softball questions for Brown as women’s issues appeared to be for Warren. The Democrat returned to taxes though in discussing defense. Objecting to across the board defense cuts, she said, somewhat impliedly, that protecting the jobs at Westover and Barnes would be impossible without revenue. The candidates’ closings were fairly boilerplate, if anti-climatic for both. Brown dropped a tornado reference, a clear underline for an ad he released featuring the natural disaster that ripped across the Greater Springfield area last year (more on that tomorrow). Madigan’s earlier admonitions to the crowd were somewhat ignored. One person loudly and individually booed Warren on several occasions. Cheers met both candidates on several occasions, but a concerted boo from the crowd only met Brown, who faced the disapproval with a nervous smile. It was clear throughout the debate that each candidate tried a different tack to reach the crowd. Both candidates mentioned a Boston Globe story that alleged more attention was being paid to the Boston area than further out west. However, Warren has held numerous events in Western Massachusetts, especially so in the earlier stages of the campaign. Brown’s response, appeared to remind everybody how local he was. Brown apparently lived in the Springfield area in an earlier life. His frequent name drops of Springfield landmarks fit well into his personality-centric campaign that focuses on his everymanhood. To the extent that that matters, Brown succeeded, but he seemed to be rushing when he did and it did not endear him to the crowd. Warren kept the race big and on issues that had the potential to nationalize the race and reach voting blocs, like women, that will likely decide the election. She did localize the infrastructure answer, but clearly her meat and potatoes were in taxation, sensible regulation and, of course women’s issues. Later at Theodore’s, where the Warren watch-party was held, Congressman Richard Neal gave a thunderous introduction to Warren. She was flanked by her husband, Mayors Michael Bissonnette and Alex Morse, Reps Mike Finn and Paul Mark and Massachusetts Democratic Committee Vice-Chair Ray Jordan. Brown’s watch party was at Samuel’s Tavern at the Basketball Hall of Fame. The reviews also seemed to fall on Warren’s side, with Adam Reilly at WGBH, Esquire’s Charles Pierce, the Washington Post and the Boston Globe, among many outlets crediting Warren with a better performance, especially on the question of women’s health. Regardless of who won the debate itself, it is impossible to not recognize that among the biggest winners may have been Madigan, the moderator and the City of Springfield. Madigan kept the candidates on time, but he did offer some latitude fairly to both candidates. Although he did not quickly fade and in and out the way WBZ’s Jon Keller did in the first debate, he did not become a stage weight like David Gregory appeared to be last week in Lowell. The City, too, has a great deal to be proud of. The coordination of its media establishments and police led to a superbly executed event. The turnout of supporters, regardless of the imbalance, was also incredibly reassuring, offering life to the area’s politics so often missing in the everyday.